Inter-CubeSat communications or satellite to satellite communications is very critical as it enables an efficient networking between CubeSats in a swarm [1, 2]. We propose a Low Earth Orbit (LEO) inter-CubeSat DTN architecture. DTN is a networking paradigm intended to offer data communication services according to store-and-forward mechanism in space environment, which is characterized by regular and extended temporary disconnections and long delays. The space DTN concepts were originally introduced and evaluated as a solution to tackle the challenges of deep space communications and to support an Interplanetary Internet IPN . Even though DTN protocols and some conventional Internet protocols, such as TCP and UDP, were assessed to be acceptable in a space environment, interconnecting CubeSats requires more research to be done to prove its feasibility . 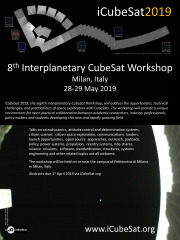 Inter-CubeSat communication is constrained by some challenges such as the limited size, i.e., 1U-3U Cubesats, small mass, i.e., 1.3 kg, low data rate, i.e., 9.6 Kbit/s, and limited power, i.e., 2 W, in addition to challenges of orientation and limited buffer space . Based on the small size and cost efficiency of CubeSats, CubeSat swarms have recently gained research interest . This is because CubeSat swarms can provide higher data rates and redundancy in terms of power budget, bandwidth and communication opportunities, hence increasing usefulness and reducing mission failure rates. Moreover, CubeSat swarms can collect data from different parts of space in the same time instant. Hence, these swarms can also help in Earth monitoring, atmospheric measurements and supporting research missions concerned with space weather. For instance, in [6, 7], the QB50 project is aiming to launch a swarm of 50 CubeSats which are developed by participating Universities. The main purpose of these CubeSats is to perform science experiments in the lower thermosphere (90 to 300 km). In this paper, we propose a routing framework where data can be routed between different CubeSats without intervention from the ground stations. Any two CubeSats can communicate by forwarding data to the ground station which has the option of using ground links to another ground station and then onto the destination CubeSat. This proposed architecture allows for cooperative and non-cooperative CubeSat swarms to communicate with each other. It may also provide continuous communication with all CubeSats. Further, it permits for many alternative paths and allows for optimisation for routing based on power use, charging rate and buffer capacity of the different CubeSats along the path.